I can’t seem to help but to mull over my last, and final, brush with Christianity. And my bizarre fear of Satan and obsession with Hell. Mostly, these fears are gone now but it seems so strange. “What happened?”, I ask myself. I was completely out of Christianity for years. 20 or 25 years. Then, after only a couple of years of going to church, I was afraid - afraid of Hell. Afraid of what Hell was doing to the unsaved. Afraid people would never hear the Good News of Jesus and roast in Hell for eternity. I can only think that the Hell concept had been like a ticking time bomb. An implanted idea that exploded when I started going to church again. I went from being sort of spiritual to being a Christian afraid of Hell in a fairly short time span. And when my logical mind was ready to leave the church, a few years later, my emotional brain was not so easily subdued. My rational self determining being was going into combat against my emotional Hell fearing subconscious being. I fought through it wearing the armor of rationality but it was actually a bit of a battle. What happened? All I can think of is that this implanted idea exploded like a time bomb. You see, I did go to a Baptist church from four years of age until nine. And sporadically through my junior years after that. I went to Lutheran catechism class for a short time. And then I attended the “You are going to Hell” Baptist church for awhile. I was a bus kid. Yet, how could I not doubt there is a Jesus. Jesus was invisible. He never did seem to save me from all the ills of my growing up years. The multiple marriages and divorces my parents went through. All the times we went hungry and had virtually no clothes. Never saved me from the ramblings of an alcoholic mother who truly did not love us. Did not save me from being abused as a young teenager. Yes, I had my doubts. I grew up, some, then got married pretty young. He was mean, my ex. I was sure that I just wasn’t a good enough wife. I could never be that wife of Christian fantasy. I tried, off and on. My ex and I never once went to church but I was stuck with this Christian concept of femininity. But I had smarts and guts and tenacity. I considered all I had read and all I was learning. I got out of that marriage and went on to make a life for myself. A life that did not include Christianity. And that was that for many, many years. Until five years after my marriage to a man that loves me with all his heart. We were sitting together at the dining room table and Hubby wanted to get saved. I said, “Okay.” Yeah, what was I thinking? So Pastor Butthead helped Hubby say the sinners prayer and off we went to church the next Sunday. 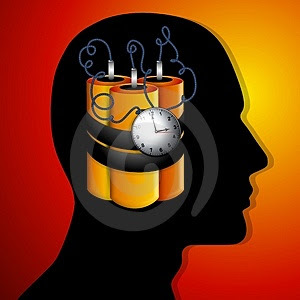 I think that is when the fuse of the ticking time bomb of my previous indoctrination was lit. The fuel was Baptist sermons. Obey, submit, be second in this world as a woman. I kept trying to like this bitter concoction they were serving. I didn’t like its foul taste but I made faces and swallowed it anyway. The fear of Hell crept in quietly at first. Then it drummed at me. People are going to Hell. How can God love me and not those people who are going to Hell? I finally quit the church because my mind said it was wrong to stay. But then I still had to work on my fear of Hell. That is when this ticking time bomb of fear exploded. I didn’t believe in Hell but I was afraid of it anyway. I had nightmares and dreams and racing heart fears. What is up with that? You can read the psychology books and the neurological studies. You can read about cults and brainwashing. You can read about right brain and left brain and reptilian brain. But it is the darndest thing when something like this is happening to your brain. Obviously, I worked my way through my fear of Hell. Here I am today a full fledged ex-Christian. But trying to understand this irrational fear of Hell and all the turmoil I went through is something I am still trying to process. In a way, I still just don’t get it.